International pop star Kylie Minogue today announces a series of special shows for summer 2019 – including a headline date on the Yorkshire coast. Kylie will play Scarborough Open Air Theatre on Thursday August 1. Shows announced today also include two nights at London’s Hampton Court Palace, Blenheim Palace, Eden Project, Manchester’s Castlefield Bowl and Edinburgh Castle. Next summer’s shows will see Kylie performing a series of career-spanning hits from her unparalleled back catalogue. 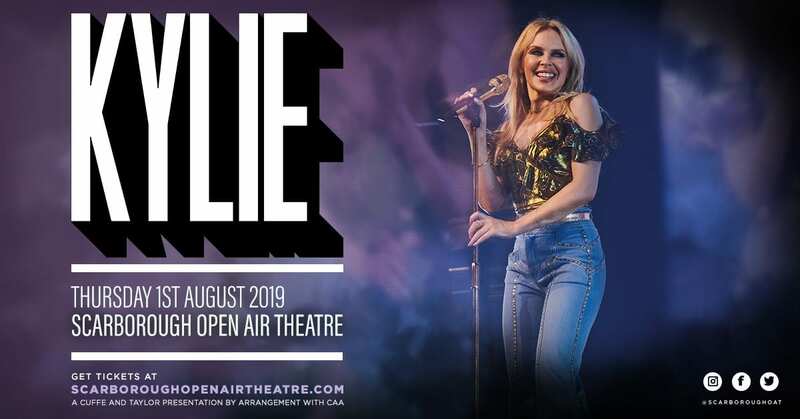 Kylie is the first headliner to be revealed at Scarborough Open Air Theatre for 2019 following a record breaking year at the venue which attracted more than 90,000 music fans to the Yorkshire coast. Venue programmer Peter Taylor, director of promoters Cuffe and Taylor, said: “Kylie is an icon, a true pop legend, and we are delighted to be able to announce her as our first headline artist for 2019. “She has recorded some of the biggest pop hits in the last 30 years and her show here is quite simply a gig fans will not want to miss. “We set the bar high in 2018, bringing many world-class acts here to the Yorkshire coast and, in Kylie Minogue, we have pulled off another coup. Tickets for Kylie Minogue’s headline show at Scarborough Open Air Theatre go on sale at 9am on Friday November 16 via www.scarboroughopenairtheatre.com or from Scarborough Open Air Theatre Box Office (01723 818111) and the Discover Yorkshire Coast Tourism Bureau (01723 383636). You can access an exclusive venue pre-sale 24 hours before general sale by signing up to the mailing list at www.scarboroughopenairtheatre.com before 5pm on Wednesday November 14, or by downloading the Scarborough Open Air Theatre mobile app.